Kabob n' Roll is one of my standby trucks. Sometimes I venture out to hit up some trucks, but I don't see anything new that looks good. In those situations, if Kabob n' Roll is around, I'll often get lunch or dinner from there, because the food is consistently delicious. I can't quite believe I haven't yet reviewed this truck, so here goes. Truck owners Wa'el and Chrissy hail from Egypt, and serve authentic Mediterranean food including falafel, lamb gyros, pita and baba ganoush. They've been on the road since January 29th, when they made their public debut at The Brig. 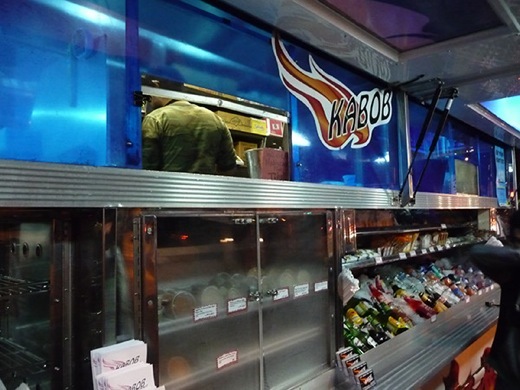 The first time I visited Kabob n' Roll was outside that very same bar, during First Friday in Venice. My two-year-old son was going through a phase where he hardly ate anything, so I was desperate to find something he'd like. I got a chicken kabob plate ($8.50), which came with grilled vegetables, basmati rice, green salad, hummus, and pita bread. I also got a complimentary side of baba ganoush. To my surprise and delight, my son practically inhaled both the kabob plate and the baba ganoush. I did the same - the chicken was juicy, and the baba ghanoush deliciously creamy and more-ish. There was still a bit more room in my stomach, and, I hoped, also in my son's, so I ordered triple cheese rolls and a mini meat pie ($5 when you order them together). It's hard to go wrong with a crispy tube of pastry filled with cheese; likewise with any kind of meat pocket, whether it's a Brazilian pastel, a Cornish pasty or a Mediterranean meat pie. Both the rolls and the pie were outstanding appetizers, even though I had them at the end of my meal instead of the beginning. My son devoured the rolls. 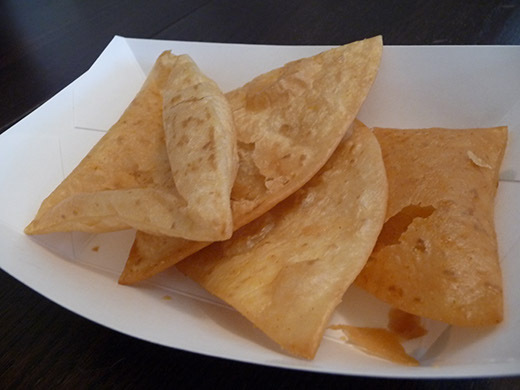 Since that first First Friday, I've visited Kabob n' Roll several more times. 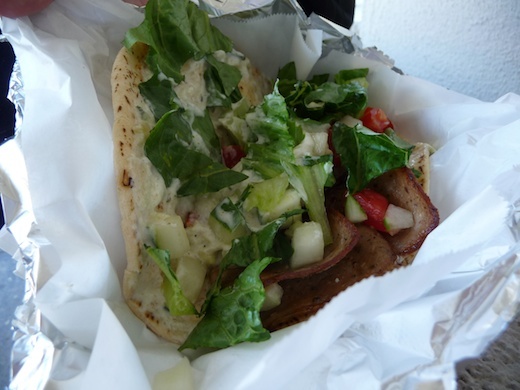 Most recently, I had the lamb gyro pita ($6) and the feta caprese ($4.50), which were both on the Specials board. 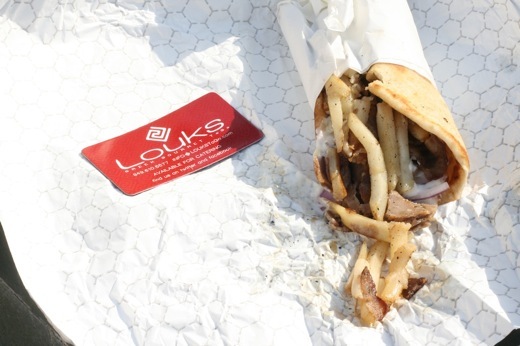 I can always count on the lamb gyro to be tasty. The feta caprese was good, but needed more dressing, and perhaps a bit more of a twist to the overall dish. 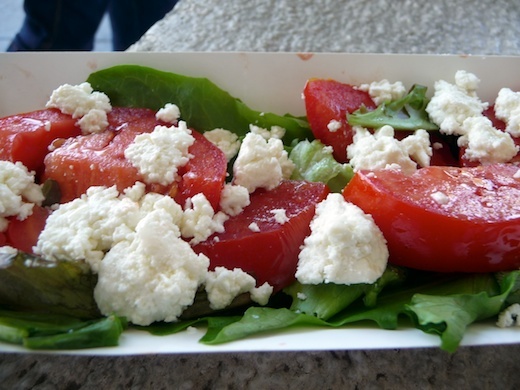 Yes, the feta was exceptionally good, and the tomatoes were at their absolute pinnacle of ripeness, but that wasn't quite enough, especially considering the dish's price: maybe the tomatoes and feta needed a third ingredient to tie them together in a more interesting way. 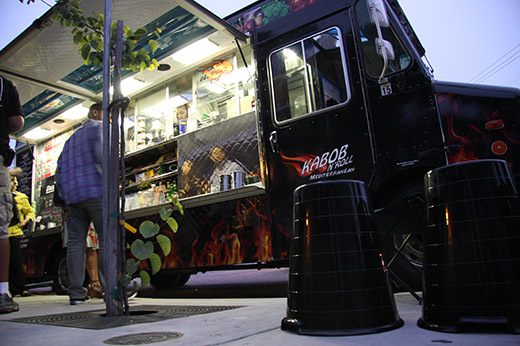 Kabob n' Roll makes a point of putting seats, and sometimes tables too, outside the truck. I'm not sure why more trucks don't do this, because it's fantastic to be able to sit down in a chair and eat, rather than finding a spot on the street to pop a squat. I understand that alfresco eating is part of the charm of food trucks, and I like it too, but I don't think seating spoil the atmosphere. Kabob n' Roll uses portable plastic pails that make great stools when they're turned upside down. 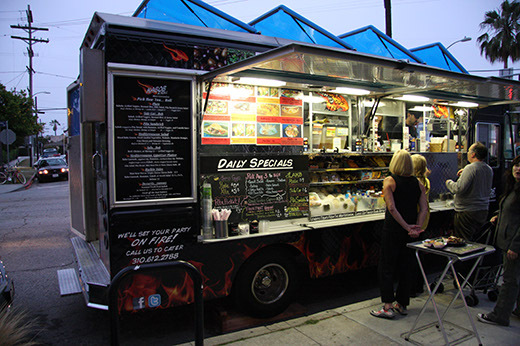 Also, Kabob n' Roll often stations a friendly employee outside the truck - he or she takes orders and helps customers decide what menu items are going to make their bellies happiest that particular lunchtime or dinnertime. I feel like Kabob n' Roll really cares about making sure I love their food. 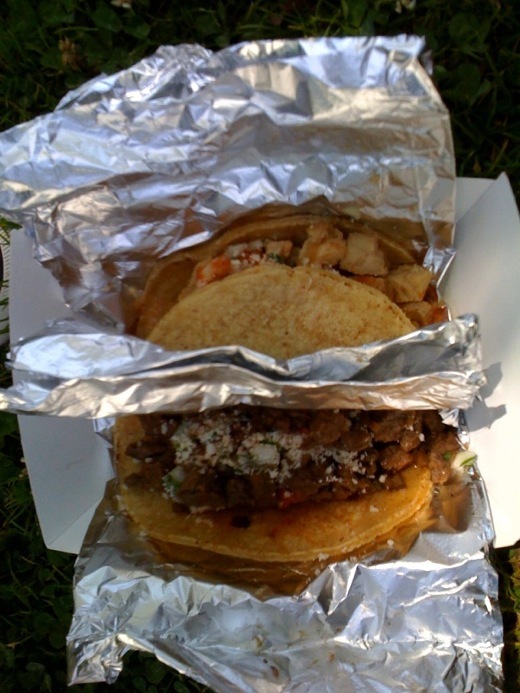 That atmosphere - coupled with the platefuls of deliciousness they sell - makes me want to come back again and again. Next: I want to try the baklava.